ChIP-sequencing, also known as ChIP-seq, is a method used to analyze protein interactions with DNA. 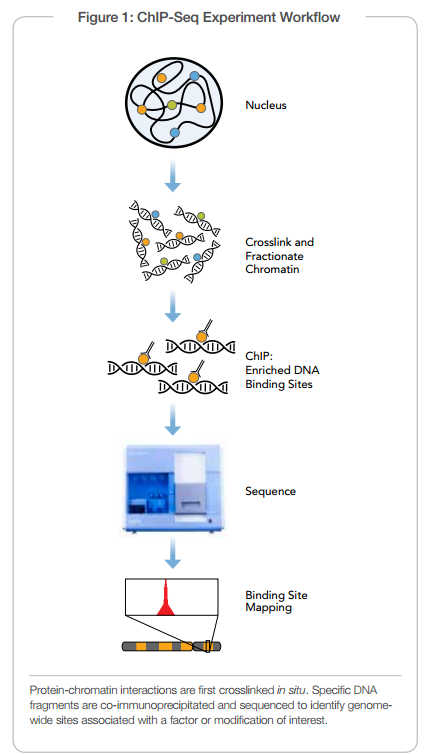 ChIP-seq combines chromatin immunoprecipitation (ChIP) with massively parallel DNA sequencing to identify the binding sites of DNA-associated proteins. It can be used to map global binding sites precisely for any protein of interest. Previously, ChIP-on-chip was the most common technique utilized to study these protein–DNA relations. ChIP-seq is used primarily to determine how transcription factors and other chromatin-associated proteins influence phenotype-affecting mechanisms. Determining how proteins interact with DNA to regulate gene expression is essential for fully understanding many biological processes and disease states. The ChIP process enriches specific crosslinked DNA-protein complexes using an antibody against the protein of interest. For a good description of the ChIP wet lab protocol see ChIP-on-chip. Oligonucleotide adaptors are then added to the small stretches of DNA that were bound to the protein of interest to enable massively parallel sequencing. 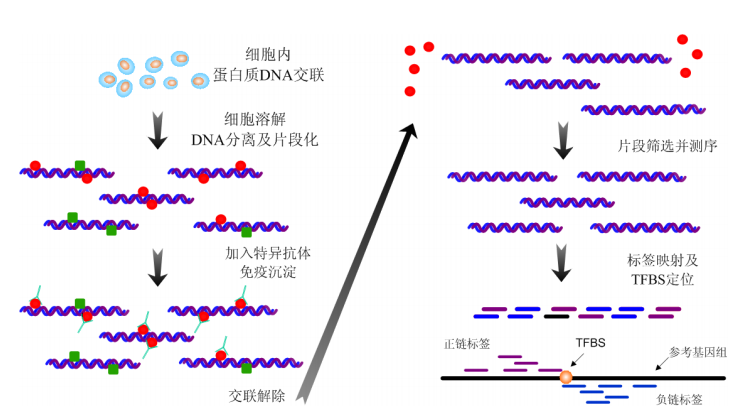 After size selection, all the resulting ChIP-DNA fragments are sequenced simultaneously using a genome sequencer. A single sequencing run can scan for genome-wide associations with high resolution, as opposed to large sets of tilingarrays required for lower resolution ChIP-chip. The read count data generated by ChIP-seq is massive. It motivates the development of computational analysis methods. To predict DNA-binding sites from ChIP-seq read count data, peak calling methods have been developed. The most popular method is MACS which empirically models the shift size of ChIP-Seq tags, and uses it to improve the spatial resolution of predicted binding sites. Another relevant computational problem is Differential peak calling, which identifies significant differences in two ChIP-seq signals from distinct biological conditions. Differential peak callers segment two ChIP-seq signals and identify differential peaks using Hidden Markov Models. Examples for two-stage differential peak callers are ChIPDiff and ODIN.